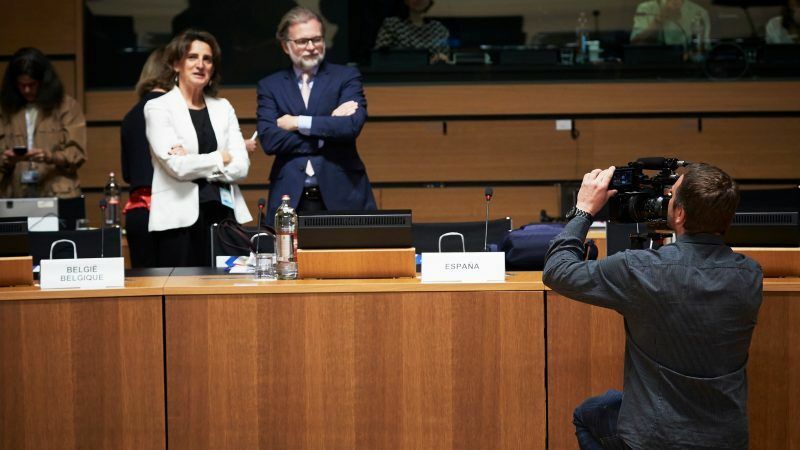 The meeting took place just two days before the final round of negotiations between the Council, representing the 28 EU governments, and the European Parliament on new renewables and energy efficiency targets for 2030. Though the position of the Council was already set some time ago, things have shifted since then. On Monday, two new diplomats were at the table: Spain’s Teresa Ribera and Italy’s Giovanni Pugliese, who were representing their new leftist and populist (respectively) governments. The new coalition government in Germany also took office in March, introducing additional uncertainty. Both Ribera and Pugliese made clear in their interventions that they wanted to reverse course from their countries’ previous stance, who were blocking more ambitious targets of 33% renewables and energy efficiency for 2030. We compiled below a few video highlights from Monday’s ministerial meeting. Ribera, Spain’s new minister for ecological transition said Spain’s new government sees this moment as a “wonderful opportunity” to be more ambitious. However, there are still a number of states trying to block the 33-33 objective, including the ‘V4’ group led by Hungary. Tibor Stelbaczky, Hungary’s deputy permanent representative to the EU, said higher ambition is not realistic or in line with what can be delivered. Poland’s state secretary for energy Michal Kurtyka echoed these sentiments, though he said he agreed with much of what Ribera had said. All may depend on Germany. The country’s environment ministry has been emboldened in the new coalition government and there may be more flexibility to agree higher-ambition targets. But Germany’s Energy Minister Peter Altmaier poured cold water on the idea of increasing ambition at Monday’s energy council. As Green MEP Claude Turmes noted on Twitter, it may all come down to whatever Altmaier privately told Temenuzha Petkova, the Bulgarian energy minister leading negotiations on behalf of the Council, about how flexible they can be on the mandate. The German minister wasn’t giving anything away in public. Turmes will be in the room today as part of a negotiating team led by Irish MEP Sean Kelly, on behalf of the European Parliament. You can follow the developments during the course of the afternoon on Euractiv’s live blog here.